When Susan Berg was 15 years old she encountered something many of us will never have to go through, losing her family in one tragic accident. While out on a boat trip with her parents and brother their boat suddenly sank. Susan, desperate and cold, swam ahead in the darkness to try and find help for her and her family. After 4 hours of struggling through rough seas in the dark Susan finally made it ashore. Her family tragically did not. Since that boating accident that claimed her family's lives 30 years ago Susan has fiercely avoided both swimming and open water. 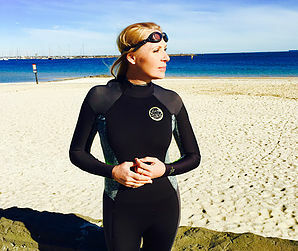 But now, as part of her journey of self-healing, Susan is ready to take on her fears by swimming the world's largest open water event- the Lorne Pier to Pub- in January 2017. Susan has started her training (and making great progress) for the event at Monash Sport; as a participant of Swim Fit at the Doug Ellis Swimming Pool, to help mentally and physically prepare herself to take on her greatest fears and help raise money for the McAuley Community Services for Women. Not only is this inspirational journey about Susan taking on her biggest fears, but also to help raise $25,000 for the McAuley Community Services for Women, a Victorian not-for-profit organisation that helps women and children who are the victims of family violence and homelessness. We are encouraging everyone to get behind Susan and show your support for an inspirational woman. Well done Susan, keep up the great work! For more information on Susan and her amazing journey visit her website or click here to help raise the much needed funds for the McAuley Community Services For Women.